Great progress has been made in the past 25 years: 15,000 less children are dying every day, but there’s more to do. Compassion is working on the frontline of these changes and we’ve seen children rise from some of the most difficult circumstances to become doctors, teachers and pastors – to change the future for their families and their communities. Together we can make this a reality for thousands more. 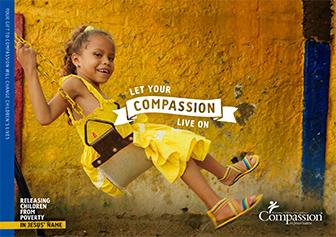 Many of our supporters, after remembering their family and friends, choose to take up this challenge by leaving a gift in their Will to support Compassion’s work. Join us and leave a legacy which will empower vulnerable children. If you are interested in finding out more about leaving a gift in your Will, then please complete this form and we will contact you in person to chat about your options. If you have any questions, please call our Supporter Relations Team on 01932 836490 or email giftsinwill@compassionuk.org.